If, like 99.8 percent of Americans, you reside somewhere other than Alaska, you probably cling to a certain set of associations with the 49th state: snow and sled dogs, salmon and oil, the malapropisms of a former governor. Most likely, you think of reality television — you know, the show about the crabs. Or the trucks. Or the gold. No, the other one about the gold. What you probably don’t think about is baseball. Yet there may not be a more baseball-crazed society outside of the Dominican Republic. The sport’s history in the far north long precedes Alaska’s statehood: Natives invented a cricket-dodgeball hybrid called anauligatuk, and conventional baseball was played in whaling camps, mining camps, and World War II military bases, on snowshoes when necessary. Satchel Paige came north in 1965 and claimed to love Anchorage at first sight, which, considering that Alaskans refer to their largest city as “the beer can in the woods,” might be the nicest thing that’s ever been said about Anchorage. 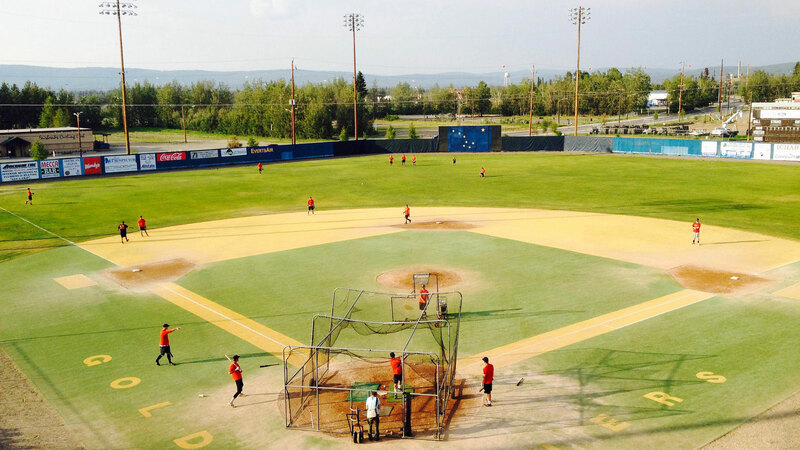 The state’s most famous baseball tradition is the Midnight Sun Game, played annually on the summer solstice in Fairbanks, home of the Alaska Goldpanners, the world’s northernmost baseball team. First pitch each year is at 10:30 p.m., more than two hours before official sundown; as the sub-Arctic sun ducks below the horizon, the game continues in dim twilight, without the aid of artificial illumination. By the late innings, the sky is bright enough to get wood on a fastball, but dark enough that your Little League umpire would have called it off. The venue, Growden Park, could be described as Bull Durham–chic: An elephant-size inflatable rubber duck greeted fans in the parking lot; a couple of derelict vans rusted in the bullpen. The wooden outfield wall was festooned with ads for quintessentially Alaskan services: rural airlines, fuel distributors, outdoor outfitters. Far beyond the left-field fence stood the squat headquarters of the Fairbanks Curling Club, onto whose roof a young Dave Winfield crushed a famous home run back in 1972. A year later, he was playing for the Padres. 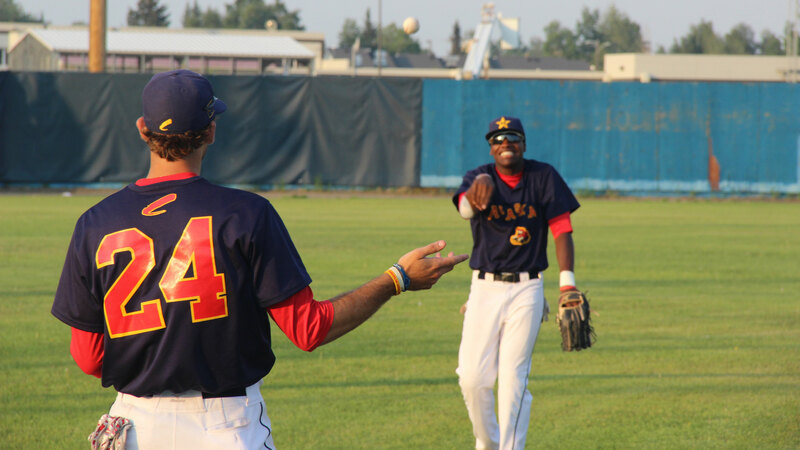 Winfield isn’t the only superstar to have gotten northern exposure in the Alaska Baseball League, among the country’s premier summer leagues for college players. In the 1965 Midnight Sun Game, a USC right-hander named Tom Seaver ended up in the hospital after he barehanded a comebacker and split his fingers open. In 1982, a 19-year-old pitcher for the Anchorage Glacier Pilots survived just one-third of an inning in his ABL debut; wisely, the Pilots manager moved Mark McGwire to first base the next day. Two years later, Peter Gammons came to Alaska to watch an unpolished 6-foot-10 lefty, nicknamed “The Giraffe,” fling scattershot fastballs. He wondered if Randy Johnson would ever make it. Cape Cod, in other words, is where you go to meet the Jessica Biel to your Freddie Prinze Jr. Alaska is where you go to hone your craft. “Whatever you do,” warned Sample, “don’t bounce it.” Five minutes later, Sullivan took the mound, waving. He bounced it. Spend enough time around Alaskans and you can’t help but notice that they take perverse pride in their ability to handle inclement conditions: Up here, the catch really is deadlier, the truck roads icier. 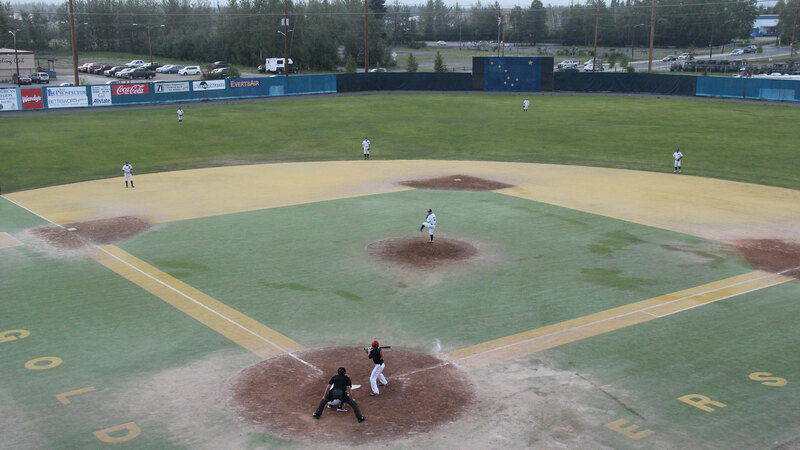 In Fairbanks, where average winter temperatures hover around minus-15, a popular adage goes, “There’s no such thing as bad weather, only bad gear.” Such cheerful hardiness makes the state a perfect home for a summer collegiate league, where players experience interminable bus rides, decrepit fields, and the ignominy of day jobs. (Winfield worked in a furniture store.) The Midnight Sun Game’s beauty is that it embraces the struggle between man and elements. Did miners need electric lights? Did whalers? Hell, no! When a swarm of mosquitoes (a.k.a. the state bird) sent a spasm of slapping and cursing through the bleachers like the wave, it felt fitting. At midnight, a singer came on to perform the Alaska flag song, a lovelier and less bombastic interregnum than “God Bless America” (“The blue of the sea, the evening sky / The mountain lakes, and the flow’rs nearby”). The fading light evoked clanging dinner bells and pinwheeling bats (insect-eating mammals, not Louisville Sluggers). Swings were late, contact weak. In the seventh, the Studs’ right fielder, who’d evidently forgotten to flip down his night-vision goggles, overran a popup, and the Goldpanners seized a 5-4 lead. “Lost it in the lights?” quipped a heckler. At 1:13 a.m., with the Panners up 7-4, closer A.J. Franks fired a blurry fastball past the last Studs’ hitter and the home team won for the eighth straight year. The crowd roared its exhausted approval and hopped in their pickup trucks. I wandered onto the infield, where Scooter Bynum, the Panners’ leadoff man and a .314 hitter at Western Arizona College, was signing autographs with weary good humor. Bynum was one of two locals on the roster, and he was something of a Fairbanks legend — at Monroe Catholic, he’d been Alaskan player of the year in baseball and basketball, and he’d been drafted in the 18th round by the Reds. He’d attended many a Midnight Sun as a fan, including a 15-inning marathon in 2010, which he sat through despite his mother’s insistence that he go to bed. Tonight, in his second Midnight Sun go-round as a player, he’d gotten two hits. On the horizon, a sliver of pink light edged into the sky. Unsupervised Little Leaguers whacked fungoes around the turf. The time was 1:27 a.m., and in 91 minutes, the sun would be up. Ben Goldfarb (@ben_a_goldfarb) is a freelance environmental journalist, correspondent at High Country News, and former collegiate pitcher with a lifetime ERA of 7.36.